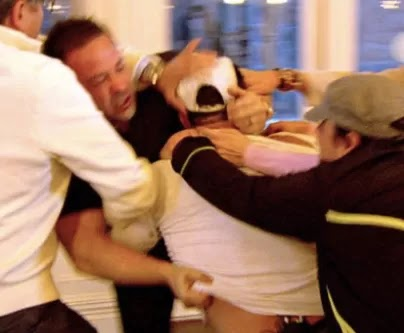 Home / Real Housewives of New Jersey / Real Housewives of New Jersey Episode Recap: Forgiveness? Real Housewives of New Jersey Episode Recap: Forgiveness? Teresa Giudice sits down with her brother Joe Gorga and a therapist at the retreat. Teresa just wants her brother back in her life and they are both getting really emotional (i.e. crying and slanging snot). Joey insists that Tre needs to change her ways and Tre agrees just to pacify the little bish boy. The therapist tells them they need to spend time ALONE (without Melissa) and I totally agree. Before they can bring other people into their relationship they need to repair what has already been damaged. Caroline Manzo is in the building to help knock some since into Joey Gorga. But before Caroline can get her paws on Mighty Mouse, the therapist calls Messylisa Gorga into the room to sit down with Tre and Joey. Messy tells the therapist that everything is Teresa's fault. Every skeleton that is seeping out of Messy's tacky Arden B infested closet is Teresa's fault. In the end, Teresa admits to doing things to intentionally hurt Melissa. She says she is sorry and offers Melissa a big hug and a "I love you". Then they bring Juicy in and the therapist makes his azz apologize too. So after all of that fighting, snatching weaves, and painted on hair being smeared everywhere, the Joe's hug it out. The ladies decide to cook and Teresa and Kathy Wakile are putting their feet until some Italian dishes. Messy is of course complaining about the heat and concerned about her fake eyelashes burning off. Then she starts drinking cocktail after cocktail and I think this heaux is flirting with Rosie? Whispering sweet nothings about a fuzzy juicy peach? Lawd hammercy. Messy has no limit to her famewhoring. Now Jacqueline Laurita and her husband Chris are having a date night at a restaurant. They are talking about the age in which they both "found themselves" in a sexual way. Chris says that Joe Gorga told him that he lost his virginity when he was 9. And did I hear this drunk bird Jacqueline say "I hope it wasn't with Teresa". Did she really just effing say that? I am so disgusted by this Jersey trash bag and I can't believe the producers actually allowed that comment to be aired. The fam is doing a trust exercise where they fall backwards into someone's arms. Juicy Joe is chosen to fall into the arms of the wasted Messylisa. They of course fall to the ground and I busted up laughing. I don't know why Messy thought she would be able to hold up Juicy and his 400lbs of muscle. Teresa then tells Caroline to fall into her arms. Caroline agrees but only if she can watch Tre and Jacqueline perform the same exercise together one day. It takes Tre a long time to comply because she knows that Jac is a two-faced nutjob but she finally agrees. Joe sits Tre down and tells her they need to make amends with Jacqueline and Chris. Tre misses Jac's friendship but does she really need someone like Wacky Jacky in her life? I think not! Things are fine the way they are. Let's phase Jac out of the series and bring in a new housewife! What say you? They are a hot mess!